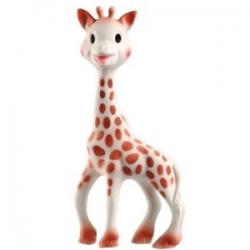 ellehermansen: Sophie The Giraffe By Vulli! 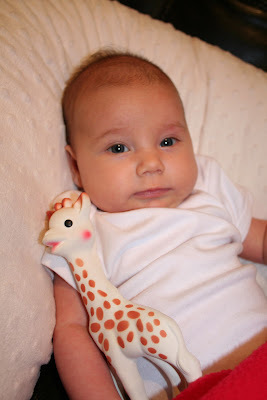 Sophie seems to be Edie's go-to toy along with her other little buddy "pie" from the French brand Vulli! Pie (in pink) is part of the collection of 3 named "Chan" "Pie" and "Gnon" after the French word for mushroom all together making them "champignon!" They are also safe because they are phthalate-free. 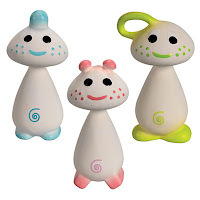 These, along with Sofie the giraffe are great toys for newborns as they feature little nubs and small limbs for babies to easily grab at and hold on to for the first time! They are wonderfully light, and have a cheery little sound when squeezed as they squeak with delight! Vulli was founded in 1946 in France and is now popular all over the world with Sofie being the eldest toy of them all! Now they make many products based around her character alone. Do any of you own Vulli products? How do you like them? You can check out other lovely things that they have up on their site. Sophie is Husdon's BFF.... I feel badly that I doubted her greatness. Hudson loves her so much I actually had to fashion him a giraffe "leash" so he doesn't lose her when he drops her when we're out. He also goes to town on the first years "apple grabber". Gotta love teething/drool season!! wow your baby has changed a lot already! Shes adorable. Isn't it insane how big she is getting? I've missed you on here :) Thank you so much!